Bronwyn Bancroft is a proud Bundjalung Woman and Artist. 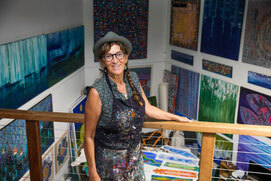 Bronwyn has been exhibiting both Nationally and Internationally for over three decades. Collections that have acquired her work include National Gallery of Australia, Macquarie University, Art Gallery of New South Wales, Art Gallery of Western Australia, International House, University of Sydney, Parliament House Art Collection, State Library of New South Wales, State Library of Victoria, Australian Museum and Artbank, as well as overseas collections such as Newark Museum USA, Prime Minister of Turkey, The Kelton Foundation USA, Volkerkunde Museum, Germany and Westpac USA. Bronwyn holds positions in the following organisations, Arts Law, Australian Indigenous Mentoring Experience (AIME), Commonwealth Bank RAP Committee and her own company, Designer Aboriginals Pty Ltd established 1985 (Director). Bronwyn has a Diploma of Visual Arts from Canberra School of Art, two Masters degrees, one in Studio Practice and the other in Visual Art, University of Sydney. Bronwyn is currently completing her Creative Doctorate.